Fukutoku-Okanoba is a submarine volcano 5 km NE of the small pyramidal island Minami-iwo-jima in the Japanese Volcano Island chain. Eruptions and submarine hydrothermal activity often cause water discoloration in the area, and during eruptions, the volcano has built several temporary new islands. The first observation of a new island was in 1904-05 when it formed Shin-Iwo-jima ("New Sulfur Island"). Small new islands were also formed during the eruptions in 1914 and 1986. Map of the volcanoes in the Izu-Marianas volcanoc arc stretchung SSE from Japan (map: Japanese coast guard). Отчет во вторник о извержения на вулкан имеет значение false. В 2010 году последнего извержения вулкана. Press photos distributed by the Japanese Coast Guard, showing the site of a probable undersea eruption of Futuku-okanoba submarine volcano on 3 July 2005. Note the discoloration of the sea-water, as well as floating peices of steaming lava blocks on the surface. A submarine volcano erupted in Japan. It is located about 6 kilometers north-northeast of Minami-Iwojima island in Ogasawaramura (about 1,300 kilometers from Tokyo). On the evening of 2 July, the Japanese coast guard spotted large amounts of steam rising to about 1 km height above the sea at the site of the submarine volcano, as well as a strong discoloration of the water. On photos taken on 3 July, porous, steaming lava blocks are appearing on the surface of the sea. Ships are advised to avoid the area. The volcano, known under the mane of Futuku-okanoba, has frequently had similar eruptions recorded during the past century, some of which have created temporary islands, last during an eruption in January 1986 that created a crescent-shaped island, which sank in March 1986. 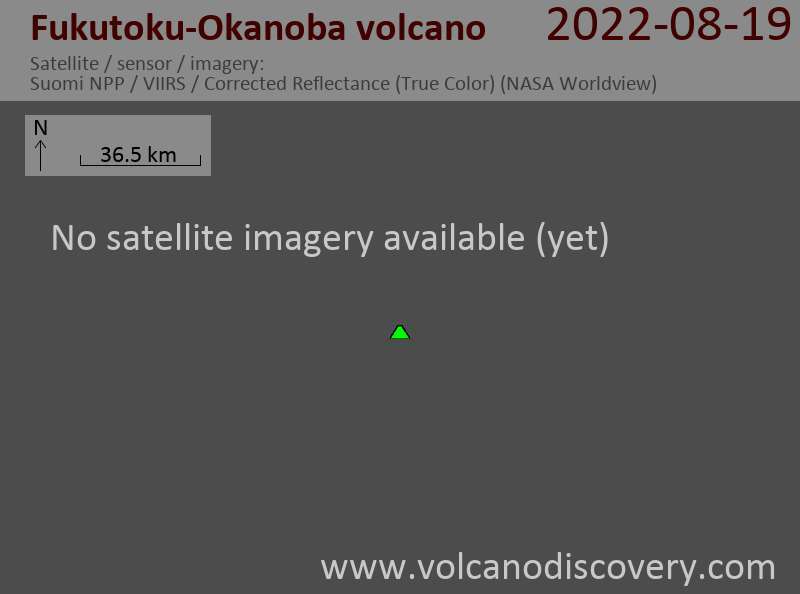 The last eruption at Futuku-Okanoba took place in 1992. Discoloration of the water above the volcano is observed frequently, probably die to intense hydrothermal activity. Volcano & eruption special tours: Tours dedicated to usually a single volcano currently in eruption. These trip, sometimes offered only last-minute through our newsletter, are among the most adventurous and most popular in our program.